We were quite surprised when we opened up the Costco March and April 2017 coupon book! As we mentioned recently, Costco has made a lot of changes to the coupon books this year. We weren’t sure what to expect, but once we opened it up we were able to relax a little. It’s got a ton of deals at 18 pages long. There are also a lot of “treasure hunt” items (new items that will be fun to try). The Costco coupons will run from March 23rd through April 17th. The 16th of April is Easter, and Costco will be closed, which is why it ends on the 17th, which is a Monday. To see the coupon book simply click the link at the top of the post. If you’d like to be notified as soon as we post the latest coupons you can sign up for our email list, or Like us on Facebook! The March and April Costco coupon book is definitely different than usual. We don’t remember seeing an outdoor blanket on sale before. We also haven’t seen the Chef’s Cut Real Steak Jerky in store before, and can’t wait to try that. The Vega Protein & Greens hasn’t been on coupon before either. 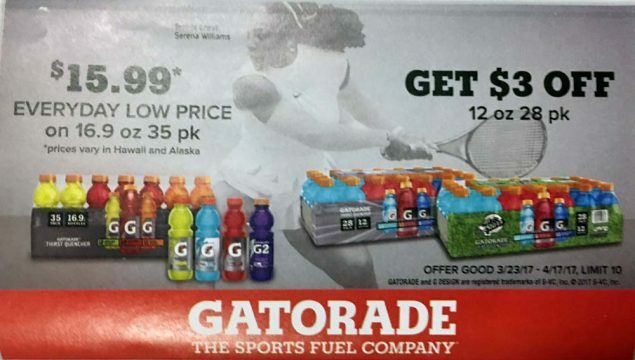 If you look closely, you’ll notice the Gatorade coupon mentions the words “Everyday Low Price.” This is an example of new every day low prices on items year round. The Samsung 65″ and 55″ TV’s are another example, they don’t have a discount, just a lower price. The good thing for us, the shopper, is that we won’t have to pay tax on the pre-coupon amount. You can find these new every day low price items in the coupon book easily because Costco has made the background of the coupon yellow instead of white, so they stand out a little bit. The tire coupon is Bridgestone, and should stay that way through the next coupon book as well. Still can’t find the March and April coupon book? Click the link at the top of the post to be taken right to the coupons. What do you think of the change? Not as bad as you thought it might be? We believe the discounts are a little deeper than usual as well, would you agree? Just about every retailer that tried the everyday low price concept instead of sales or coupons failed miserably. Notably Sears and JC Penney almost went out of business because of their attempted change in pricing. Coming on the heels of a membership fee increase, the everyday low price is nothing more than a price increase for those items we came to trust would be on sale due to coupons. Your statement (below) Is bull! Just about every retailer that tried the everyday low price concept instead of sales or coupons failed miserably. Each month there are less and less items I buy from the Costco coupon book. I am downgrading my membership and will still go to Costco regularly, as the fresh food, dairy, eggs and organic items are still great value. But I will start looking elsewhere and comparing prices more. I did visit Costco every two weeks for items in the coupon book like shampoo and items that I can store in the cupboard, but I will be shopping there less now and I have noticed I am spending less each month at Costco. I will also downgrade my membership at Costco, IF I renew. Not as impressive as it was in the beginning. May switch to Sam’s. I really was expecting to receive more coupons throughout the year. Did you downgrade your membership. I tried and it was a nightmare. My husband had upgraded with one of those pushy people at checkout. It was time to renew so I said I just wanted to be gold, not executive and the cashier said he could not change it. I waited at customer service and 3 different people refused to do it. My food was melting after over 30 minutes and the employee disagreed about who would downgrade. I found out employees get in trouble or have some sort of quota for memberships and no one wanted to take a “hit” by my downgrade. It took an hour and I was downgraded. I would have just cancelled but right now I live where we have 1 Costco and no other clubs for over 100 miles. If I move or a Sam’s or BJ’s moves in I will be gone in a second. Super excited to try the Chef’s Cut Real Steak Jerky! This coupon book seems quite a bit better than the last few. Going to take a while to get used to the “Every Day Low Price” thing; will reserve judgement for now. I seen more items this time in the March-April book. Last month was a big dud as there wasn’t anything I buy on sale. This one had a few more items in it that I haven’t bought before here. The laundry supplies I buy is usually cheaper than what they have on sale so I just compare ounces and prices. They’ve never had the Japanese foods on sale. This month, the Yakisoba fried noodles are on sale for the first time. Costco used to carry the Dragon Boat potstickers which were the best tasting imo. They appeared to have been pulled due to using chickens with bird flu. The Nongshim Udon noodle soups are often sold at unannounced discounts. They cost about 30-40% less than we can get HMart or Lotte supermarkets. Even without the discount, they’re about 10-15 percent below the bulk cartons sold at Asian stores. Sears and JC Penney run sales all the time. They cater to a shrinking and poorer middle class. All the department stores are in trouble, even some like Target that have resorted to selling food. There’s talk that malls will have to be anchored by supermarkets. I don’t work for Costco, but I have been a member since they opened up their first store in MN. With a free 1 year membership. I know it’s been at least 20 years, that I have been shopping there. And I have been responsible for many people joining Costco. Because I have never seen a company that takes so good of it’s customers and employees. So I have relayed my opinons to many, regarding what a great store Costco is. If you realize that they will not have the cheapest price on everything that is sold. No company could ever do that. But if you shop there with that in mind. You will not find a store like Costco that wants you to be 100% happy with your purchases. Thats why if you don’t like something from Costco, they make it easy to return things, no questions asked. I even saw somebody returning a taped up case of Diet Coke! I have ordered flowers for Mothers Day, and got a call from Costco. Saying flowers were not going to cost as much as originally quoted. So I would receive a refund for the couple of dollars. Most companies would keep price reduction, instead of passing savings on. For something that was already paid for. I see a few people here talking switching to that other place. I”l bet that the other places don’t offer extended replacement warrantees that Costco does. Theres a reason that Costco sells almost double the sales Sams has. Even though there are a couple hundred less Costco stores, than there are Sams stores. So it’s not just me that thinks they are and always will be the better place to shop. Apparently some of you don’t know, that if you buy Executive Membership. And you don’t get a check for at least the extra $55 (or whatever it is now) difference. Between Basic and Executive membership. You can get the remainder of the difference refunded at the counter, when you renew. But not if you renew at registers. As they say, you can’t please everyone. But Costco does try to please as many as possible. Happy to see more of you people leaving the Costco here in Nashua NH is very very busy….Bye!! !